Both roll and hand roll are terms that are associated with popular Japanese food known as Sushi. Various ways are used to make rolls that are meant to serve this dish that is mainly comprised of rice and seafood. The common ingredient in sushi dish is rice though there may be minor additives. Meanwhile, many people often get confused about the difference between the two hence it is imperative to begin by explaining the meaning of each term. The other Japanese name for roll is Maki which was derived from the word maku which refers to wrapping or to coil. This type of sushi includes cooked rice, fish, seafood or in some cases fruits and vegetables and these ingredients are wrapped in a seaweed also known as nori with the aid of bamboo mats. The result is a cylindrical roll that can be cut into six or eight pieces and it is ideal for sharing with other people. Each piece is known as a roll and it can be served to many people. One major aspect to note about a roll is that the cylinder that is made from the wrapping is cut into several pieces and these can be served to many people. A hand roll on the other hand is also known as Tamaki and this is a system that is used to wrap sushi specifically meant for one person. In this method, the rice and fish are wrapped into a cone using seaweed instead of a cylinder or long tube that is used when making a roll. This type of sushi at times can include vegetables or fruitsA hand roll is prepared using a hand and it can be observed that it is quickly served after preparation. When one is hungry, a hand roll is appropriate since it is big enough to satisfy the hunger of one person. Likewise, the major difference between roll and hand roll lies in shape rather than the ingredients that may be involved. A hand roll is cone shaped while a roll is tabular of cylindrical. However, there are also other factors that differentiate a roll from a hand roll. What is the difference between Roll and Hand Roll? Roll is cylindrical in shape. The other issue about a role is that it is made through the help of a makisu or bamboo mat. A roll is traditionally rolled in seaweed also known as nori and it can also be wrapped in soy paper. A hand roll on the other hand is cone shape. It is also wrapped using seaweed or nori. It resembles the shape of an ice cream. The aspect of shape plays a pivotal role in distinguishing the two. A roll is also known as Maki. This is a Japanese name often used to call a roll. A roll is small because it is cut into pieces. After its preparation, a roll is cut into six to eight pieces and it is served to many people. This element of cutting a roll into small pieces is the major determining factor that differentiates it from a hand roll. A hand roll is made bigger and ready for consumption since it is not cut into smaller pieces meant to feed many people. Again, a factor that determines the difference between the two types of sushi. Essentially, a hand roll is meant for one person and this is the reason why it is made big. There are different types of sushi rolls and they include the following: Hosomaki, Chumaki, Futomaki and Uramaki. These differ according to the ingredients that have been used in their preparation they can also be cut into many pieces. There is only one type of hand roll. This is the Tamaki and it is consumed as it is and it does not required to be cut into smaller pieces. A roll is eaten using chopsticks. The main reason for this is that a roll is cut into smaller pieces and these can be properly handled through the use of chopsticks. These again are traditional eating utensils that are commonly used in Japan. Roles are consumed in just one bite. A hand roll on the other hand is consumed using bare hands. The main reason behind this is that a hand role is made as a big cone and it is specifically meant for a single person. Therefore, chopsticks cannot be used on such big item which cannot be consumed in one bite. Overall, it can be observed that when one is hungry, he or she should go for a hand roll since it is enough for one person without sharing. A hand roll is not divided hence these are some of the main reasons why one can opt to have this type of sushi instead of the one that is cut into smaller pieces. Basically, both roll and hand roll are terms that are associated with the preparation of popular Japanese food known as Sushi. As discussed above, these two concepts significantly differ in various ways. The main factors that make these two concepts differ are summarized below. A sushi roll is also known as maki, a Japanese name implying to coil or to wrap something. 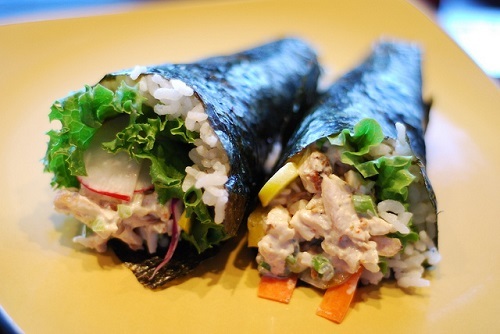 On the other hand, a hand roll is also known as a Temaki. Again this is a Japanese name. The other major difference between a roll and a hand roll pertains to their shape and size. A roll is cylindrical in shape and it is generally smaller. A hand roll is cone shaped and it resembles the shape of an ice cream cone. It is bigger than a roll. The main ingredient in the preparation of a roll is rice while in some cases rice may not be used in the preparation of hand roll. It should also be noted that there are different types of rolls while there is only a single type of hand roll. A roll is usually cut into six or eight pieces and it is intended to be shared among many people. In contrast, a hand roll cannot be chopped into pieces since it is designed as a single entity as it is. It cannot be shared by many people since it is specifically prepared for a single person only. The other notable difference between a roll and hand roll is that the former can be eaten with chopsticks while the later can be eaten using bare hands. The main reason for this is that a roll is divided into several pieces as observed above and they can be consumed with one bite only. However, a hand roll cannot be divided and it can be consumed in more than two bites. Over and above, it can be concluded that both roll and hand roll are associated with a popular Japanese dish called sushi. As noted, these two concepts are different though they are closely related to Sushi. The main difference between them is about their shape and size instead of elements related to ingredients. A roll is small because it is cut into smaller pieces and this has been observed to be the main factor that determines its difference from a hand roll which is not divided into smaller pieces. It has also been observed that a roll is prepared with the aid of bamboo mats while a hand roll as the name suggests is made using a hand. A roll has cylinder shape while a hand roll is cone shaped. Rice is used as the basic ingredient in the preparation of a roll while some hand rolls are only comprised of vegetables and fruits. However, seaweed is used for wrapping both roll and hand roll. 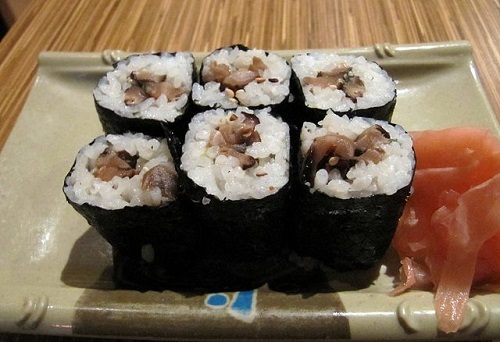 Overall, a roll and hand roll differ though they both belong to the category of sushi, a Japanese delicacy. Trevor Mark. "Difference Between Roll and Hand Roll." DifferenceBetween.net. August 29, 2017 < http://www.differencebetween.net/object/comparisons-of-food-items/difference-between-roll-and-hand-roll/ >.